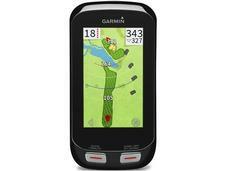 Garmin Approach G8 GPS Unit (30,000 Courses Uploaded) - $349.99 - GolfersEdgeOnline.com - Best Golf Equipment On The Web! The Garmin Approach G8 GPS is light, thin, has a 3” color touchscreen and is pre-loaded with over 30,000 worldwide courses. New for the G8 GPS are functions like ‘Big Numbers Mode’ which lets you increase the size of the numbers displayed showing distance to the front, center and back of the green. New ‘PinPointer’ technology on your G8 GPS gives you blind shot assistance and shows you the direction to the pin when you can’t see the green. Exclusive to the G8 GPS is Wi-Fi connectivity which lets you download course updates automatically using a Wi-Fi connection, and with Bluetooth Smart Notification you can link to your iPhone (4s or later) to receive texts, emails and alerts. Preloaded Course Maps: 30,000 with free lifetime course updates and no fees or subscriptions. Brand new in a factory sealed box. *The IPX7 water resistance designation means the device will withstand incidental exposure to water of up to one meter of depth for 30 minutes. If you have any more questions about the Garmin Approach G8 GPS Unit (30,000 Courses Uploaded); do not see the model you are looking for; need custom options; or prefer to not purchase online, then please call us at (630) 656-1291.